The Iron Lady is a 2011 British-French biographical drama film based on the life and career of Margaret Thatcher (1925–2013), a British stateswoman and politician who was the first ever female and longest-serving Prime Minister of the United Kingdom of the 20th century. The film was directed by Phyllida Lloyd. Thatcher is portrayed primarily by Meryl Streep, and, in her formative and early political years, by Alexandra Roach. Thatcher's husband, Denis Thatcher (1915–2003), is portrayed by Jim Broadbent, and by Harry Lloyd as the younger Denis. Thatcher's longest-serving cabinet member and eventual deputy, Geoffrey Howe, is portrayed by Anthony Head. While the film was met with mixed reviews, Streep's performance was widely acclaimed, and considered to be one of the greatest of her career. She received her 17th Oscar nomination for her portrayal and ultimately won the award for the third time, 29 years after her second Oscars' win. She also earned her third Golden Globe Award for Best Actress – Motion Picture Drama award (her eighth Golden Globe Award win overall), and her second BAFTA Award for Best Actress in a Leading Role. The film also won the Academy Award for Best Makeup and the BAFTA Award for Best Makeup and Hair. In flashbacks, the audience is shown a young Margaret Roberts working at the family tobacconist's shop in Grantham, listening to the political speeches of her father, whom she idolised – it is also hinted that she had a poor relationship with her mother, a housewife – and announcing that she has won a place at Somerville College, Oxford. She remembers her struggle, as a young lower-middle class woman, to break into a snobbish male-dominated Conservative Party and find a seat in the House of Commons, along with businessman Denis Thatcher's marriage proposal to her. Her struggles to fit in as a "Lady Member" of the House, and as Education Secretary in Edward Heath's Cabinet are also shown, as are her friendship with Airey Neave, her decision to stand for Leader of the Conservative Party and eventual victory, and her voice coaching and image change. Further flashbacks examine historical events during her time as Prime Minister, after winning the 1979 general election, including the rising unemployment related to her monetarist policies and the tight 1981 budget (over the misgivings of "wet" members of her Cabinet – Ian Gilmour, Francis Pym, Michael Heseltine, and Jim Prior), the 1981 Brixton riot, the 1984–1985 UK miners' strike, and the bombing in Brighton of the Grand Hotel during the 1984 Conservative Party Conference, when she and her husband were almost killed. We also see (slightly out of chronological sequence) her decision to retake the Falkland Islands following the islands' invasion by Argentina in 1982, the sinking of the ARA General Belgrano and Britain's subsequent victory in the Falklands War, her friendship with U.S. President Ronald Reagan and emergence as a world figure, and the economic boom of the late 1980s. By 1990, Thatcher is shown as an imperious but ageing figure, ranting aggressively at her cabinet, refusing to accept that the "Poll Tax" is unjust, even while it is causing riots, and fiercely opposed to European integration. Her deputy, Geoffrey Howe resigns after being humiliated by her in a cabinet meeting, Heseltine challenges her for the party leadership, and her loss of support from her cabinet colleagues leaves her little choice but reluctantly to resign as Prime Minister after eleven years in office. A teary-eyed Thatcher exits 10 Downing Street for the last time as Prime Minister with Denis comforting her. She is shown as still disheartened about it almost twenty years later. Eventually, Thatcher is shown packing up her late husband's belongings, and telling him it's time for him to go. Denis' ghost leaves her as she cries that she actually is not yet ready to lose him, to which he replies "You're going to be fine on your own... you always have been" before leaving forever. Having finally overcome her grief, she contentedly washes a teacup alone in her kitchen despite saying it was a role she would never accept. Filming began in the UK on 31 December 2010, and the film was released in late 2011. In preparation for her role, Streep sat through a session at the House of Commons in January 2011 to observe British MPs in action. Extensive filming took place at the neogothic Manchester Town Hall, which is often used as a location double for films which feature the Houses of Parliament because of its architectural similarity. Streep said: "The prospect of exploring the swathe cut through history by this remarkable woman is a daunting and exciting challenge. I am trying to approach the role with as much zeal, fervour and attention to detail as the real Lady Thatcher possesses – I can only hope my stamina will begin to approach her own." NPR commentator Robert Seigel and Thatcher biographer John Campbell accused writer Abi Morgan and star Meryl Streep of having the most say in the film's production and dictating some historical inaccuracies, such as the film's photography showing no other woman serving in the House of Commons during the time Thatcher was serving, with the hopes of presenting a different image of Thatcher to the film's American audience. It is suggested in the film that Thatcher had said goodbye to her friend Airey Neave only a few moments before his assassination, and had to be held back from the scene by security officers. In fact, she was not in Westminster at the time of his death and was informed of it while carrying out official duties elsewhere. The film does not portray any other female MPs in Parliament. In fact, during Thatcher's time in Parliament, the total number of female MPs ranged between 19 and 41. Additionally, her cabinets are always depicted as all-male, but The Baroness Young, who served as Chancellor of the Duchy of Lancaster and later Lord Privy Seal, was a cabinet member between 1981 and 1983, while also serving as leader of the House of Lords. The Labour Party leader Michael Foot is depicted as a critic of the decision to send a task force to the Falkland Islands, and Thatcher is shown admonishing him in the wake of Britain's victory over Argentina. In fact, Foot supported the decision to send a task force, something for which Thatcher expressed her appreciation. John Campbell noted that her decisions in office became an inspiration for the Labour Party's pro-middle ground policies enacted when Tony Blair served as Prime Minister. Campbell also noted that while Thatcher thought the House of Commons was dominated by a patronising male environment, and that the film showed the representation from her point of view, it did not encourage her to maintain the upper middle class image she used early in her political career like the film suggests and that Thatcher did in fact exploit the fact that she was raised by a grocer in small Lincolnshire town and had a very ordinary background when she was running for leader of the Conservative Party. Thatcher's staunch opposition to the 1990 reunification of Germany is not mentioned either. The Prime Minister had felt that reunification might pave the way for the expansion of Nazi sympathy, and distrusted the West German government. Despite disagreements with France over European integration, the French Government united with Thatcher in opposition to the reunification of Germany as well. The Iron Lady received mixed reviews from critics, although there was strong praise for Streep's performance. On Rotten Tomatoes, the film has an approval rating of 51% and an average score of 5.7/10, based on 217 reviews. The site's consensus reads: "Meryl Streep's performance as The Iron Lady is reliably perfect, but it's mired in bland, self-important storytelling." At Metacritic, the film has a score of 54 out of 100, based on 41 critics, indicating "mixed or average reviews". The film's depiction of Thatcher has been criticised by her children, Mark and Carol, who are reported to have said, before completion of the film, that "it sounds like some left-wing fantasy." Stuart Jeffries of the British newspaper The Guardian was cautiously optimistic about a non-British actor playing Thatcher. Karen Sue Smith of America wrote that "by combining the Baroness's real roles of wife, mother and leader, the film's portrait of her does what many purported "lives of great men" fail to do – namely, show the person in context, in the quotidian." The Mail on Sunday reported in August 2011 that some viewers invited to a test screening of the unfinished film were concerned at its depiction of Thatcher's frail health in her later years. This view was also shared in the media subsequent to the film's release. The Daily Telegraph reported in January 2012 that "it is impossible not to be disturbed by [Streep's] depiction of Lady Thatcher's decline into dementia" as part of an article that was headlined: "The Iron Lady reflects society's insensitive attitude towards people with dementia." Roger Ebert gave the film two stars out of four, praising Streep's performance but lamenting that "she's all dressed up with nowhere to go" in a film that cannot decide what it wants to say about Thatcher: "[f]ew people were neutral in their feelings about [Thatcher], except the makers of this picture". Despite the film's mixed reviews, Streep's performance in the title role garnered much critical acclaim. Kevin Maher of The Times said: "Streep has found the woman within the caricature." David Gritten in The Daily Telegraph commented: "Awards should be coming Streep's way; yet her brilliance rather overshadows the film itself." Xan Brooks of The Guardian said Streep's performance "is astonishing and all but flawless". Critic Baz Bamigboye of the Daily Mail wrote: "Only an actress of Streep's stature could possibly capture Thatcher's essence and bring it to the screen. It's a performance of towering proportions that sets a new benchmark for acting." Richard Corliss of Time named Streep's performance one of the Top 10 Movie Performances of 2011. Streep's portrayal ultimately won her the Academy Award for Best Actress (her 17th nomination and third award overall), as well as several other awards, including the BAFTA Award for Best Actress in a Leading Role, and the Golden Globe Award for Best Actress – Motion Picture Drama. The film also won the Academy Award for Best Makeup. Thatcher died on 8 April 2013 having never seen the film. Her children have actively refused to watch the film. The film grossed $30 million in the North America, and $85 million in other markets, for a worldwide gross of $115 million. "The Great in Great Britain"
The trailer for the film features Madness's ska/pop song "Our House". The teaser trailer features Clint Mansell's theme tune for the science-fiction film Moon. Not included on the soundtrack album or listings although credited among the eight songs at the end of the film is "I'm in Love with Margaret Thatcher" by Burnley punk band Notsensibles, which was re-released as a single due to the publicity. The song appears seventy-five minutes into the film, as part of the Falklands War victory celebrations. The Iron Lady was released on DVD in the United States and the United Kingdom on 30 April 2012. The special features in the DVD include Making The Iron Lady, Bonus Featurettes, Recreating the Young Margaret Thatcher, Battle in the House of Commons, Costume Design: Pearls and Power Suits, Denis: The Man Behind the Woman. ^ "Thomas Newman to Score 'The Iron Lady'". Film Music Reporter. 23 September 2011. Retrieved 25 September 2011. ^ "THE IRON LADY (12A)". British Board of Film Classification. 16 November 2011. Retrieved 12 April 2013. ^ "The Iron Lady (2011) – Financial Information". ^ a b "The Iron Lady (2011)". Box Office Mojo. Retrieved 16 September 2014. ^ Hoyle, Ben (21 March 2007). "Iron Lady Set to Follow the Queen on Screen". The Times. Retrieved 25 January 2011. ^ Peck, Tom (2 July 2010). 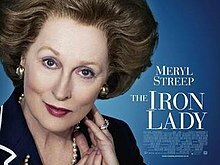 "Meryl Streep Takes on Her Toughest Role: The Iron Lady". The Independent. Retrieved 25 January 2011. ^ "The Iron Lady (2011)". IMDb. 19 October 2010. Retrieved 25 January 2011. ^ a b c d e f g "How Accurate Is 'The Iron Lady'?". NPR. Retrieved 9 September 2017. ^ Thompson, Jody (18 February 2011). "First Look: Newcomer Alexandra Roach Who's Set to Become a Star as a Young Margaret Thatcher in The Iron Lady". Daily Mail. Retrieved 26 April 2011. ^ a b Jefferies, Stuart (9 February 2011). "Meryl Streep Playing Margaret Thatcher – What's Not to Like?". The Guardian. Retrieved 9 February 2011. ^ Palmer, Martyn (29 November 2011). "An American Playing Margaret Thatcher? Behind the Scenes on the Remarkable Film Starring Meryl Streep as The Iron Lady". Daily Mail. Retrieved 19 December 2011. ^ "Meryl Streep Attends Parliament for Thatcher Research". The Independent. 20 January 2011. Retrieved 26 October 2011. ^ McQueeney, Kerry (5 December 2011). "The Day Meryl Streep Gate-Crashed Our Wedding: Moment Hollywood Legend Made an Appearance at Couple's Special Day... Dressed as Margaret Thatcher". Daily Mail. Retrieved 30 December 2011. ^ "'The Iron Lady': What Meryl Streep and Co. Got Wrong About Margaret Thatcher". Yahoo!. Retrieved 9 September 2017. ^ "Women MPs and parliamentary candidates since 1945 – UK Political Info". Ukpolitical.info. Retrieved 9 September 2017. ^ "The Iron Lady". Rotten Tomatoes. Flixster. Retrieved 8 March 2013. ^ "The Iron Lady Reviews". Metacritic. Retrieved 8 March 2013. ^ Walker, Tim (17 July 2010). "Margaret Thatcher's Family Are 'Appalled' at Meryl Streep Film". The Daily Telegraph. Retrieved 25 January 2011. ^ Karen Sue, Smith (20 February 2011). "A Grocer's Daughter". America. Retrieved 11 February 2011. ^ Walters, Simon (21 August 2011). "Friends Revulsion at Film That Portrays Lady Thatcher as 'Granny Going Mad'". The Mail on Sunday. Retrieved 18 October 2011. ^ "The Iron Lady and Margaret Thatcher's Dementia: Why This Despicable Film Makes Voyeurs of Us All'". The Daily Telegraph. 14 January 2012. Retrieved 19 January 2012. ^ "The Iron Lady". Rogerebert.com. Retrieved 8 February 2012. ^ "Meryl Streep Film The Iron Lady Wows British Critics". BBC News. Retrieved 16 November 2011. ^ "The Iron Lady: Review". The Daily Telegraph. Retrieved 16 November 2011. ^ "The Iron Lady: First Screening". The Guardian. Retrieved 16 November 2011. ^ "An Insult? No, This Shows Why Maggie Was So Mighty". Daily Mail. Retrieved 16 November 2011. ^ Corliss, Richard (7 December 2011). "The Top 10 Everything of 2011 – Meryl Streep for The Iron Lady". Time. Retrieved 13 December 2011. ^ "Meryl Streep Explains Globes Cursing". Access Hollywood. 16 January 2012. Retrieved 21 January 2012. ^ Karger, Dave (12 February 2012). "BAFTA Winners Announced". Inside Movies (blog of Entertainment Weekly). Retrieved 11 April 2013. ^ "Still the Iron Lady". Daily Mail. 19 March 2012. Retrieved 12 March 2013. ^ "Iron Lady, The- Soundtrack details". Soundtrackcollector.com. Retrieved 9 September 2017. ^ a b "The Iron Lady Movie Trailer". 29 June 2011. Retrieved 9 September 2017. ^ "Oscar 2012 winners – The Full List". The Guardian. 27 February 2012. Retrieved 27 March 2012. ^ "Nominees and Winners for the 84th Academy Awards". Academy Awards of Motion Picture Arts and Sciences (Oscars). Retrieved 27 March 2012. ^ "Bafta Film Awards 2012: Nominations". 27 March 2012. Retrieved 17 January 2012. ^ Pond, Steve (12 February 2012). "'The Artist' Dominates at BAFTA Awards". Reuters. Retrieved 27 March 2012. ^ "Iron Lady DVD Movie". Cduniverse.com. Retrieved 9 September 2017. This page was last edited on 15 April 2019, at 20:31 (UTC).